Loitering. 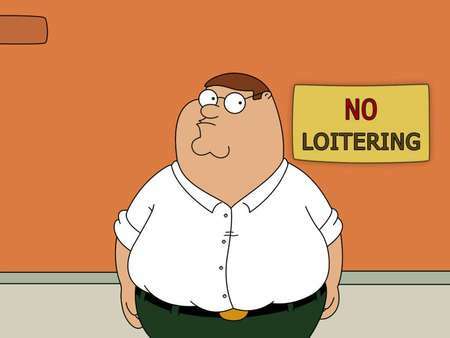 Have you ever wondered what it means to to loiter? Well, I have news for you. For example, loitering is when you go to the library and get comfortable in those nice, warm fabic chairs. There’s also the kind that two people can sit in at the same time. And when you sit in those you feel all sleepy. So you go to sleep in it for awhile. Except you like that spot so much you don’t leave it for hours. Chances are most that other students want to come in and sit down too. They might be looking for that type of chair to sit in, too. They find one and make themselves at home, too. And soon, all the chairs are taken up and the library is then standing room only. And what’s strange it’s barely nine o’clock, the place looks like a cafeteria, and they don’t serve breakfest in the library. Now I have to admit that I have nodded off in the library myself, too. I guess that’s why they don’t have elevator music playing because if they did then everyone in the library would be in pajamas and have pillows. And there would be a nightlight in one corner of the room. Do you know what I’m talking about? I’m talking about people who use the library as a crash pad. Even the Dharmasalas up north has an overnight facility where if you got no place to go. They’ll take you in and give you a bunk and a place to shave in the morning. Maybe the library could moonlight as a bed and breakfest. The checkout desk could become a check in desk. And the librarian could be heard saying, “Front”. You could leave your laundry done. They would sew buttons on your shirts. You could pick up the mail. All kinds of neat stuff. And all because you chose KMC Manipal as your college.